On February 18, 2019, Bishop Borys Gudziak was appointed by Pope Francis as the Metropolitan and Archbishop of the Ukrainian Catholic Archeparchy of Philadelphia. A native of the U.S., for the last six years, Bishop Borys served as eparch of the Eparchy of St. Volodymyr in Paris, serving the Ukrainian Greek Catholic faithful in France, Belgium, the Netherlands, Luxembourg, and Switzerland. Catholic Business Journal reporters have met and spoken with Bishop Gudziak at the Napa Institute over the past several years and each time have been so impressed with his focus, leadership and bravery during some very tense and challenging situations over recent years, especially in the Ukraine. 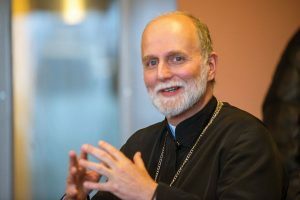 Below please find a fresh, recent interview with Bishop Gudziak conducted by Marianna Karapinka and the Religious Information Service of Ukraine (RISU). If you have a short time to peruse this, we recommend you jump to the last question. Q. What was your reaction to the decision of the Synod and of the Holy Father nominating you to the Philadelphia Archeparchy? A. Allow me to be open with you. The nomination—and everything that it entails—provokes deep thoughts and sentiments. The first is gratitude and first to God. As I —hopefully—mature as a human being I am increasingly drawn by the mystery of our God in Three Persons. This may be daring—but I want to be in the presence of the Father, Son and Holy Spirit… My central belief is that the Son came into this breathtaking yet often frail human race to be with me and you, even in death, to bring us home to the Father. The Passion and Resurrection of Jesus and our salvation in Christ for me are ever more awesome and inspiring… The guidance and comfort of the Holy Spirit give me more hope and joy. I feel the protection of the Mother of God and solidarity of the communion of saints, especially the martyrs. Life in the Lord, who served and suffered, invites me to suffer with and serve gladly those to whom I am called. My desire to give myself fully to God and share His love and friendship with others overflows! I am grateful to the Holy Father, Pope Francis, to the Father and Head of the Ukrainian Greek Catholic Church, His Beatitude Sviatoslav and to the Synod for their confidence and blessing. I am at peace. As a Christian and priest, I try to accept God’s will as expressed by the Church, in this case neither seeking nor resisting this nomination. I have a sense of peace, despite the strong emotions that I am experiencing. Metropolitan-Emeritus Stefan Soroka welcomed me in the Philadelphia Archeparchy many times. He gave me prescient advice when I was beginning my pastoral service in Paris: people and pastoral works first, not buildings. Bishop Andriy Rabiy, energetic and active as Apostolic Administrator, has been ushering me home with care and competence. The other bishops of the metropolia have fraternally encouraged me in these days. I eagerly await the encounter with them and the archeparchy’s clergy, religious and faithful. We lived in relationship. We lived humbly in challenging social and economic conditions. There is an ongoing war in Ukraine, which has continued for more than five years. Most of the Ukrainian Greek Catholic faithful in the Paris Eparchy are undocumented immigrants or refugees. Virtually all of us, me included, were struggling to learn one or more of the six official languages of these three kingdoms and two republics. France, the Benelux, and Switzerland are among the most secularized countries in the world. As we prayed together and worked to set and maintain the course on rough and unpredictable seas, we were together in sacrifice and service. Our eparchy became a modest but authentic and faith-filled corner of the Kingdom of God, which is already here and still yet to come. I will never forget these experiences. I will miss the energy and life of the Paris Eparchy, the enthusiasm of our small team, and the love of the people. The clergy and laity are fantastic and were my teachers and guides in many issues. I am most grateful to the bishops’ conferences of Western Europe, to the various charities and foundations that supported our mission, and to the countless individuals who helped us grow. The sense of gratitude for the last six and one-half years is actually quite overwhelming. Having lived 30 years of my adult life in Europe, I look forward to the adventure of getting to know the United States and its Church in a new way. I have great respect for the Church’s service to successive generations of immigrants and the poor. The development of Catholic intellectual life in the US has been an important contribution to the Universal Church. I trust that at this time of great challenge, which is also a time of purification, the Church in America is called to a new spiritual and moral witness through conversion and service, boldly announcing the Good News. In this the Ukrainian Catholic Church is has its specific call, one that it has been developing for almost a century and half and one that should be critically and creatively revisited for the people of today and tomorrow. During times of profound division, aggression, fear, and even scandal, which are also times of great human opportunity and abiding Christian hope, the Lord will bestow His grace on the Church and through the Church in America. Q. At your enthronement at the Cathedral of Notre Dame in Paris on December 2, 2012, you called the clergy and faithful of the Paris Eparchy to advance together “from glory to glory.” What was that pilgrimage about? What has happened during those six years? A. Our pilgrimage “from glory to glory” (2 Corinthians 3:18) in the Paris Eparchy should be seen in spiritual terms, not least because our material assets were extremely modest. We were actually destitute. The eparchial facilities were in disrepair, most of them actually closed. Our “glory” clearly could not be in large projects and initiatives. Life had to be simple. This was, in fact a grace. We focused on the basics: the Word of God, liturgy and prayer, fostering mutual trust by tending to each other’s wounds and encouraging lay men and women to take responsibility in the Church. Following the Holy Father’s lead, together we profoundly experienced a year of mercy—God’s towards us and mercy towards each other. We moved from the glory of one feast and sacrament to another, from one authentic encounter to the next. We learned to celebrate wholeheartedly, and to pray and sing together with the mystical symbolism and choreography of the liturgy. Our point of departure was one love—the love of Christ—to build another—our friendship, solidarity, and fruitful cooperation. Through sacrifice and losing ourselves we entered repeatedly into the Paschal Mystery, encountering the essence of life in Christ. We listened and spoke to each other from heart to heart. Because in the end that is where God resides and places His glory—in our hearts and souls, in our freedom, in our dignity, in our life-giving capacity. We also laughed—a lot—together, at ourselves, and with each other. Q. The Paris Eparchy did launch new projects. Are they sustainable, how will they develop? A. Today, I humbly think of the many things that we were not able to accomplish and of what remains to be done. But it is indeed true that the Lord blessed many initiatives. The Eparchy opened new parishes and missions. At first there were 20, now there are 44. The number of our priests more than doubled, from 9 to 23. The Eparchy’s canonical structures and administration were created. The existing incorporating associations were reformed and brought into legal order. Laypersons were called to key positions of governance. The presbiteral and economic councils, six eparchial commissions, the communications service, and a mission to seafarers came into being and are working effectively. Generous donors from many countries responded to the initiatives. The Eparchy purchased a church that had been unused for services for two-hundred years and launched the Cultural Center of Anne de Kyiv, named after the eleventh-century Kyivan princess who became Queen of France. With the participation of some 100 clergy, outside theologians and consultants, and lay members of the eparchy, a five-year pastoral plan was elaborated. The eparchial team formulated a vision to revive our pilgrimage center in Lourdes. The abandonment of some projects was reversed; for example the Paul Kohut Youth Center in Alsace is being slowly revived. The Eparchy sponsored a number of international academic conferences and published literature about the life of our Church in different languages. There were a good number of television programs and films about the Eparchy in French and Ukrainian aired in different countries. Finally, in cooperation with the Ukrainian Catholic University in Lviv, our laity managed what may be the first in-depth sociological survey of a discreet representation of the massive emigration entitled “Challenges of Contemporary Migration: The Ukrainian Community in Paris.” But the overriding “project” was fostering an atmosphere of mutual charity and a life of communion, ecclesiastical unity of clergy, religious, and faithful while trying to open ourselves to those outside of the Church. Our hopes and spiritual aspirations seemed fantastic. But a faith journey is believing that God wants us to live in His Kingdom. Much was accomplished because together we believed in God’s presence among us. The sustainability of the eparchial projects is predicated on this faith. Seven years ago, I went through a departure from a rather ambitious spiritual endeavor when I left the position of rector of the Ukrainian Catholic University (UCU) in Lviv to come to Paris. Some believed that this might imperil aspects of UCU’s life. In fact, the opposite happened: once I became bishop in Paris, the university developed exponentially. I hope that will also happen in the Paris Eparchy (laughs). The most important thing is to continue to foster a spirit of responsibility, mutual trust, and transparency in spiritual life, Church governance, and stewardship. It is important to speak clearly in truth but to do so gently, with mercy. In an eparchy that stretches almost 2000 kilometers (over 1,200 miles) from north to south and from east to west, with small, dispersed missions, spiritual unity is essential. We came together as often as we could: the clergy and lay leaders from the five countries met almost once a month for three days in a monastery. In addition, as I mentioned before, we held eight eparchial councils (diocesan synods) over the last four years. These councils ceased being special occasions and became a regular forum for decision-making and governance—priests, religious, and lay women and men including the youth, jointly discerned God’s will and shared responsibility with the bishop. I trust that this practice, now embedded in the corporate culture of the Paris Eparchy, will not be lost easily. I also hope that synodality will be the way of life of the Church in the United States and globally. This modality has been repeatedly encouraged by the pope. Q. What do you fear most? What is your greatest concern? A. In general, I try to fend off fear—except a healthy fear of God. Fear is a bad advisor. Generally, it either paralyzes or leads to aggression. The Church should always be concerned with two fundamental and interconnected dangers: a loss of faith and the waning of prayer. Without faith we do not have the life of the Church; without prayer we cannot foster our relationship with God. Then everything crumbles. I remain mindful that petty vices can create big problems: envy among clergy and laity; the impatience and self-promotion of talented people; unbridled passions, especially anger; self-referential rhetoric and reflections; the creation of cliques or parties among the faithful. Pope Francis speaks regularly about these issues. They can arise anywhere. The danger of ignoring real problems is also a concern. These are the instruments of the evil one with which he undermines the building of the Kingdom. But my confidence in God and my brothers and sisters on both sides of the ocean is greater than my fear. Q. Bishop Hlib Lonchyna, ordinary of the London Eparchy for Great Britain and Ireland, became the Apostolic Administrator of the Paris Eparchy. How would you introduce him to your faithful? A. I am thrilled that the Holy Father named Bishop Hlib Lonchyna of London as Apostolic Administrator of the Paris Eparchy until a new bishop is chosen. Bishop Hlib is a monk and a man of the Word of God. He is an accomplished celebrant and student of the liturgy, a highly respected retreat master, and a man of broad culture. He is also a gifted musician and speaks many languages, including French, sonorously. Bishop Hlib is clear in his doctrine and generous in his mercy. Crucially, he knows the Paris Eparchy well—he visited us regularly, served and preached in different parishes, and taught us many things in the last years. He knows personally the priests and their families, and they know him. He brings joy to our faithful. I hope once he comes I won’t be forgotten too soon (laughs). Q. What is your state of mind as you start your new service? A. I’m hopeful. At the beginning I seek to listen and learn, to become brother, father, and pastor for the clergy and faithful. It is important to pray and think things through, to develop a future vision for the Archeparchy of Philadelphia and to work closely with the other eparchies of the metropolia, as well the Eastern Catholic, Roman Catholic, and Orthodox bishops and their clergy and faithful. I hope that we can make a step forward in seeking ecumenical cooperation with our Protestant neighbors, and inter-religious inter-ethnic, and interracial harmony. The poor and marginalized should be in our heart. In the Ukrainian Catholic University, for example, the mentally handicapped became central to our pedagogy and mission. The poor can help us see God, because Jesus is poor in this world. I believe that we need to listen to each other and speak heart to heart. I hope to lead by listening to the Lord and my brothers and sisters. For now, it’s essential for me to hear well and not prematurely to formulate agendas, which might be merely of my own making. Q. You were born and raised in America, but you lived 30 years of your adult life in Europe. How do you perceive the US at the present time? What are the needs of Ukrainians of the different waves of immigration? A. Countries and cultures are diverse, but the basic spiritual DNA of all human beings is the same. Over my lifetime, I have had the opportunity to live or serve in a dozen countries. In recent years, I usually crossed an international border at least twice a week. Because my aged mother, of blessed memory, who died last June, lived alone in Syracuse and needed support, I traveled to the US three or four times annually. I observed the deepening divisions in American society, the superficiality of moral discourse, social media, and the increasing virtuality of interpersonal communication. We are becoming increasingly addicted to stimuli—gastronomic, chemical, informational, sensual. These same challenges are prevalent both in Western and Eastern Europe and concern Ukrainian immigrants of different waves. In the twenty-first century we all are called to start over, to go deeper, to follow Jesus’ calling “put out into the deep” without fear—duc in altum! Pope St. John Paul II called it the “New Evangelization.” In this life the greatest depth is in the human heart. We need to hear the heart’s beat and its yearning; and the heart needs to realize its true destiny. That is where God speaks. This is my first task as an archbishop-nominee: to listen carefully, thoughtfully, prayerfully. Q. Do you feel like coming home? A. Yes, it is a homecoming for reasons I’ve already mentioned and for others. After decades of an itinerant life, the definition of home for me ceased to be merely geographic. For me, home is a place where I live good relationships reflecting our relationship with God. Yes, I feel I’m coming home, not only because of my personal history, but because there are good, godly people in America, in our Church, as well as outside of it. Q. As scandals in Pennsylvania and other states are made public, the Catholic Church in the US endures difficult times. Now, being a member of the US bishops’ conference, how will you face this challenge? A. Sexual abuse of young people, or indeed of anyone, in the Church and outside of it is a great scandal of our time. The suffering of the victims is unspeakable. It is a spiritual crisis. At issue is a profound lack of virtue. We need conversion, a return to the basics. Much has been done in the Church to begin addressing it. But clearly much more needs to be done. I admire those who deal with the crisis squarely. I understand that today in America the Church is among the safest places for young people. But still much needs to be done to heal wounds of the past, to hear the victims who were silent for decades. I hope that the Church purifies itself so that it can continue to be a leader in the struggle for dignity and safety of all vulnerable persons throughout their life from conception to natural death. We have to face the truth humbly, with the acknowledgement of, and repentance for, our sins. When we stop fearing, a new hope returns. Several weeks ago, the Paris Eparchy experienced a seminar conducted by Father Hans Zollner, SJ, about the extent of sexual abuse globally and in the Church and the inadequacy of our response to it. Fr. Hans is one of the main organizers of the meeting on abuse called by Pope Francis in Rome. The stories and statistics of those violated were nauseating. And yet awareness of the truth leads to hope. If we live in illusion, we are condemned to anxiety. We know it’s fake and sooner or later we are going to fall through the floor. Illusions are being stripped away. This is painful, but ultimately the truth generates hope. I come as one who needs to learn and listen, and I’m more than willing to be taught. I hope that all of us can contribute to the eradication of any violence and abuse. God created us in freedom and calls us to its fullness, which is always accompanied by a call to responsibility. Those structures that do not support God-given freedom and dignity will not last, including ecclesiastical ones. It’s okay if they perish. Some things will fall and disintegrate. It has happened in history: the Roman Empire collapsed, as did many modern colonial empires. The Church has in the past disappeared in certain parts of the world, only to flourish elsewhere. It is the Lord’s Church and He will guide it if we do not get in the way. As people of faith we have no other choice but to believe that God’s plans for His Church are larger than our imagination, that He with His mighty hand can rescue His faithful and rebuild His Church. For me, that’s not a theological theory or a pious dream: I witnessed it in my life and in my Church. In the second half of the twentieth century, the Ukrainian Greek Catholic Church was obliterated as a visible, public, legal institution. After two generations of relentless persecution, from 1945 to 1989, it seemed destined to disappear. And yet after unspoken humiliation, those living martyrs and confessors who with humility accepted God’s guidance led the Church out of the catacombs and into a new life. The fire of persecution burned away superfluous or even harmful aspects of the Church’s life while forging the faith of a small remnant. That small band of witnesses was then called to bring the faith to millions. Today, in Ukraine, the Church of 4-5 million faithful has 800 seminarians. Fifty years of war and persecution reduced its 3000 priests in 1939 to 300 aged priests in 1989, but today it has again 3000 priests in or from Ukraine, many of them serving generously in Paris Eparchy and throughout the United States. As a Church historian and pastor, I find comfort and inspiration in the twentieth-century salvation history of the Ukrainian Greek Catholic Church. Authenticity in prayer and worship, selfless service, and humility are the only possible ways to live the Gospel convincingly in contemporary society, especially amidst the Church’s present difficulties. True faith and love, prevail, even in unbearable circumstances; so does hope. The three great things of which St. Paul writes bring peace and joy. With God’s help, I hope to testify in Philadelphia and throughout the Archeparchy about the witness of our fathers and mothers in the faith. They endured and prevailed spiritually and morally through the power of God. So can we.